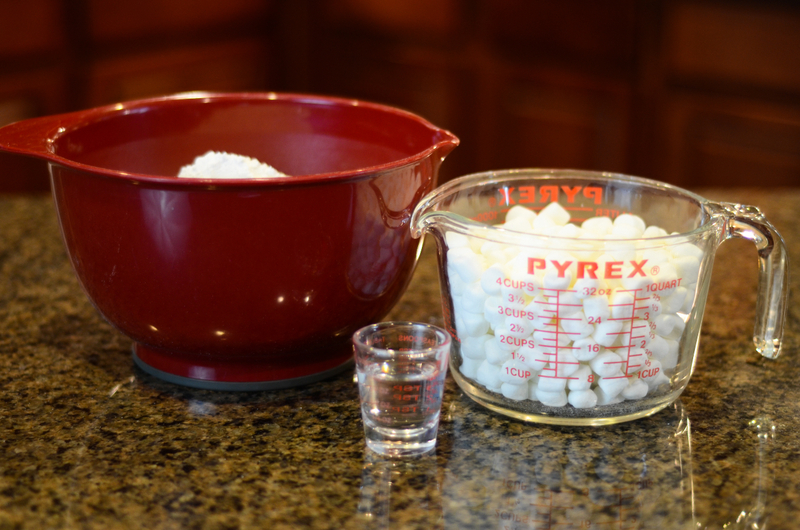 Add the water to a microwavable safe bowl full of marshmallows. Put it in the microwave for 30-45 seconds. 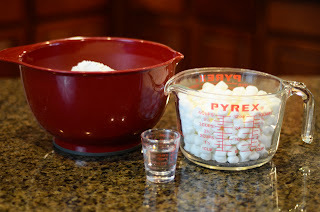 Stir the marshmallows and check for any lumps and stick in the microwave for 15 more seconds. Add the melted marshmallows into the powdered sugar and keep stirring until you can't anymore! You can now flavor your fondant or color it right now. Take it out of the bowl and put powdered sugar all over your work surface and start kneading it until it is no longer sticky. Then it is finished! Make sure you wrap it properly so it keeps the moisture in! I would also use it right after you make it since it is so fresh. I used this fondant for my spring cake and it was tough to get it colored and I had to put it in the microwave to warm it up. I don't think I would have had trouble if I used it the same day I made it. So this is a good alternative if you ran out of fondant and needed to make more! The Wilton stuff in my opinion is horrible to work with and the taste is blech! If I buy fondant I buy Fondarific. If you try that brand you will never ever buy Wilton. I even like satin ice fondant. Trust me if I don't make it those 2 brands will make you switch for sure! Awesome! I have never heard of Fondarific! I'll have to try it if I don't feel like making my own fondant sometime! Thanks! So I am making my daughters birthday cake and I was wondering will it still look/taste the same if I make it the night before and just put it in the fridge? Yes! I have actually done that a couple of times and it still tasted and looked great! Good luck! Hi great tutorial! I decorate cakes and this is the only fondant I use. If I can make one suggestion, the marshmellow fondant comes out even better if you add at least 1/4 cup of crisco shortening! I recently found your blog and I love it! That is a great idea! I will have to try it and then add it to my recipe! Thanks!! I want to use fondant for a 9x13 layered cake.. Will this recipe make enough? I have made marshmallow fondant before but found it dries out with darker food coloring. Have you had issues with food coloring and this fondant? When I color it, it does seem to dry up a little bit but I always add some piping gel to it to make it a little bit more soft! Hi Brooke, how much vegetable shortening should be added? And is it per per batch? Because I'll probably be making a double batch so that I can make the bows from your tutorial, but in black and I don't want it to dry out, especially it being my first time working with fondant...by the way got any tips for a first timer using fondant and attempting at making the bows in your tutorial? Please let me know! I have a birthday cake to make, (a doll cake), by 9/7. Can I make the fondant now so I won't be rushing last minute? And can I use the large marshmallows? Thank you! I'm not sure if the fondant will be able to last that long. I think that if you add less than a 1/4 cup of vegetable shortening in the mixture it could make it last longer! You can use large marshmallows, it just might take longer to melt :) Good luck! can you add vanilla extract to the dough?